9/19/2013 - Neither of these cards innovate beyond what has already been suggested for Tesla, but rendering them out and putting them next to each other helps us to imagine how they might really play, or see issues we might have missed when just theorizing about them. This version exhibits the "but scrap doesn't do anything by itself" 'problem' but given the number of effects that would count or eat artifacts in Tesla, and the number that exist outside of Tesla, I'm still not convinced that's a deal beaker. Discuss. 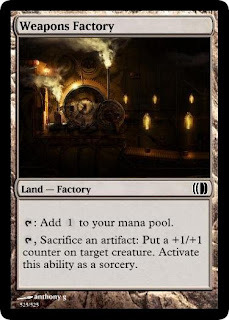 In most sets, Weapons Factory would look fairly weak, while in Tesla it looks very strong. Is that dichotomy good like Shatter and Terror in Mirrodin, or bad because we can't properly balance cards like it between Block, Standard and Modern? i like that the scrap tokens don't do anything because that is the nature of scrap. if it did something, it would no longer be scrap. I like the feel of the land that it melts down your scrap into weapons. would work really well in that version of tesla. Crazy thing is that in tesla with scrap, that land is probably uncommon. Scrap not doing anything is very Scrap-ful, but should we be focusing on the Scrap in the first place? I feel that building up your artifact from salvaged parts is very fun. But the focus should be on the building and salvaging, not in depicting the scrap pieces themselves. 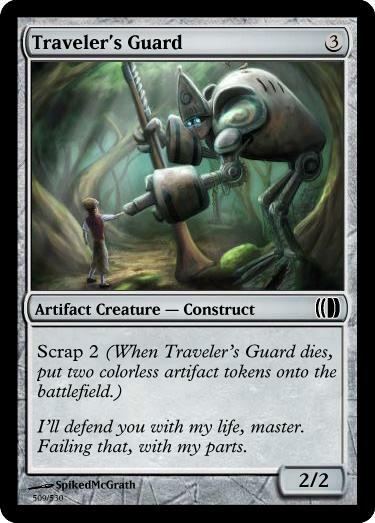 You could represent scrapping by exiling an artifact card from your graveyard as a cost. I'm not a fan of making a token type just for the sake of counting as an Artifact and sacrificing. Building an artifact from salvaged parts is indeed the part about scrap that I find the most interesting, but you're right it's the building itself that's the cool part. Perhaps an artifact-delve mechanic would work. It lets you build big things, and provides a use for cantripping chromatic star-like trinkets. To talk about this problem, let's call mechanics like Scrap "Commodity mechanics." You get a kind of Commodity like Scraps, Money, Souls, Fuel, Chi, etc. that you can spend like currency within the set's ecosystem. There is one subset of cards that produces a commodity without defining what it does. 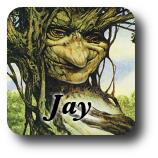 Then another subset of consumes or utilizes that resource, defining what that thing is for. I personally feel most of these are a trap in set design. But I'd like to ask first; Do you guys see a problem with Commodity mechanics? Have you ever thought of designing a set like that? What stye of Commodity mechanics would be ok and what style would be problematic? 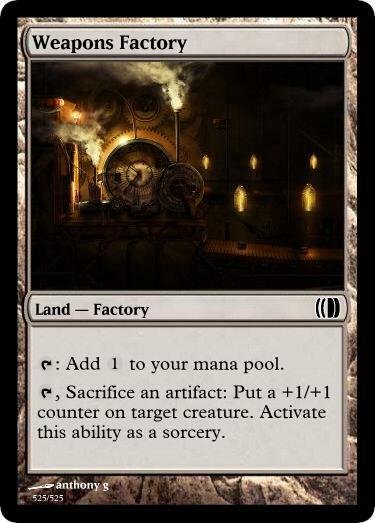 I think commodities have to have an inherent meaning, like Poison counters or Eldrazi spawn. Otherwise, it's just a random number that only works in the bio-dome. A commodity that has zero interaction with the rest of the game outside of the card's designed specifically to interact with it is indeed very limiting and will usually be a design mistake. Artifact tokens, however, interact with metalcraft, affinity, Tinker, Atog, Artillerize, Barrage Ogre, Braids, Covetous Dragon, Blinkmoth Urn, Burden of Greed, etc (IE, scores of cards that care about artifacts in a number of very different ways). That we're doing that with an existing game entity without adding anything new or parasitic to the game also helps. Does that mean there isn't a better way? Absolutely not. Expending artifacts (by sacrificing them or exiling them from the graveyard [and maybe even discarding from hand]) is an excellent solution that combos equally well with artifacts from outside the block (but doesn't combo with any of the cards I listed above) and does it without generating tokens, which—you are very right to point out—do Nothing on their own. It's definitely not strictly better, but is at least arguably better. "No - they don't do anything." I think I agree. Commodities in a vacuum are poor design, and scrap tokens just barely pass (but do pass) the threshold for "has interaction outside the biodome". I think we can explore some mechanics or top-down concepts that use Scrap and see whether that opens up any ideas; but I definitely think Tesla as a finished product would be much worse including them as-they-are.